Newsline has continued in its ridiculous campaign of bluff and bluster against the BBC Money Programme. But still, litigious though it is, it has not got round to suing the BBC. Many - solicited - letters from members and supporters have been printed. 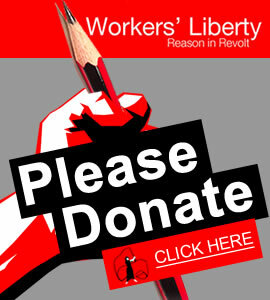 The campaign continues against Socialist Organiser, linked with the BBC according to the well-tried Stalinist technique of the "amalgam". Example from a piece by long-standing member Alex McLarty: "Trade unionists! Members of the labour movement! Be warned! Depending on its substance a small dose of poison can do a lot of harm. What is the substance of Matgamna and 'Socialist Organiser'? We know enough now. Time may tell even more". Much of the denunciation of SO is extremely shrill and hysterical, lynch mob stuff. It is also extremely sad. People write expressing their faith in the charlatans who put out Newsline. Letter after letter testifies to real sacrifices and devotion. People who couldn't possibly know the secrets of the autocratic and conspiratorial leaders of the organisation write to testify from their own experience of struggling to raise money for the paper that it could have no financial link with Libya. Playwright Tom Kempinski writes in ringing tones, "We are not bought" - rhetoric that rings pathetic and false in the circumstances. As false has have always been the hopes and wishes of the many fine revolutionaries who have devoted themselves to Healy's "machine for maiming militants". We reproduce the editorial in which they responded to our comment last week. Newsline's editorial uses the code word "Zionist", but in fact it is talking about a conspiracy of Jews which runs, they say, from the centre of Mrs Thatcher's Cabinet, to the commanding heights of the BBC, all the way through to Socialist Organiser. If a Jew becomes "the youngest ever chairman" of the BBC, what else can it be but a "Zionist" conspiracy? Pre World War Two antisemites explained communism and finance capital alike as different aspects of a single World Jewish Conspiracy. So now do these petrodollar anti-Zionists of Newsline depict "the centre" of Thatcher's government and Socialist Organiser as secretly linked and bonded - despite ocean-wide class and political differences - by a hidden network of "Zionists". "Zionism" here is not a political reference meaning those who support the right of Israel, or a modified Israel, to exist. That would include the overwhelming majority of the people of Britain. There are Zionists and Zionists. There are Zionists and Jews. It is the latter who are the conspirators. Even an anti-Zionist Jew, this racist logic says, will have ineradicable loyalties and allegiances more basic than politics: some people are congenital "Zionists". SO is opposed to Zionism? It supports the national rights of the Palestinians? SO advocates a secular democratic state in Palestine within which Jewish and Arab Palestinians could live as equals? Though rejecting with contempt the "socialism" of the "Green Book", it would support Libya against an imperialist invasion? That's just a front. Don't the communists pretend to denounce the "finance. capitalists" and the "finance capitalists" make war on communism so as to fool those on both sides who don't know there is an International Jewish Conspiracy?Thus Gerry Healy in his dotage seems to have rediscovered the "Protocols of the Elders of Zion" - that forgery of the Okhrana, the Tsarist political police, which became a warrant for genocide against the Jews of Europe. Newsline in effect deﬁnes Jews as "agents of Zionist imperialism" - which must be the very heart of imperialism if, as they say, its controlling tentacles reach secretly right into "the centre" of Mrs Thatcher's Cabinet. The Jews, it would seem, are now the international janissaries of imperialism. How can the mutant remnants of what was once the most serious revolutionary organisation in Britain have come to this? For the last nine or ten years,the WRP has seen the world, and especially the international Trotskyist movement, mainly in terms of police "conspiracies" and the operations of "agents" and counteragents. Vast amounts of newsprint, time and money have been given over to the search for the "conspirators" and "agents" who are the root of all evil in the world,and whose subterranean combats and manoeuvres seem in the WRP's eyes to have replaced the struggle of classes as the locomotive of history. Add to this paranoid obsession Mr Healy's present "cupboard love" politics which puts Zionism and anti-Zionism at the centre of world politics - because to judge by all the circumstantial evidence, Libyan gold is at the centre of the WRP's survival - and the scenario more or less writes itself. The inbuilt logic of such "politics" takes over and takes off. It easily becomes a matter of Jews - "Zionists" - against all the rest. The racist logic breaks through in their account of the Money Programme's "witch hunt". Why is this the work of "Zionists"? Because a Jew is appointed chairman of the BBC? Because only "Zionists" are concerned with the Middle East? Because the Jewish Chronicle showed interest in an expose of people it must regard as at least potential pogromists. Of course, if the Jewish Chronicle was tipped off in advance, that is proof positive that "Zionists" were in control! Or it is that all "witch-hunters" are Zionists? No: it is a view of the world in which the Palestinian question is the central pivot of the struggle of two basic camps, the imperialist and the "anti-imperialist", decrees that within the imperialist countries, "Zionists", linked by ineradicable ties to the arch-imperialism - Zionist imperialism - are the main enemy, everywhere. Faced with an earlier left wing flirtation with antisemitism dressed up as anti-capitalism [the German socialist] August Bebel said that: "antisemitism is the socialism of idiots". WRP-style anti-Zionism is the anti-imperialism of idiots. And it is indistinguishable from antisemitism. All Jews other than certain religious anti-Zionists and some revolutionary socialists do support Israel - that is, they are Zionists. They are a people scattered through all segments of society. Seek evidence that there may be a conspiratorial network of Jews and you will find it - red Jews and Rothschilds, members of Mrs Thatcher's (or Ronald Regan's) cabinet and writers for SO. These links are the raw material from which theories about "Zionist conspiracy" can easily be spun. But the only possible "rational" common denominator on which to base such a theory is "race" (whatever that may be). Morally outraged by Israel - and rightly outraged - the more emotional or "third worldist" left in Britain has sometimes tried to brand all Zionists, that is, the vast majority of Jews, as racists, and (especially during the ultra-left heyday of the early 70s) proposed to treat them accordingly. The slogan "drive the Zionists out of the labour movement" has been raised - it can only mean: drive the Jews out of the labour movement. There is simply no way that this sort of anti-Zionism can avoid shading over - despite the best "anti-racist" intentions - into antisemitism. Even if it were true that Jews who support Israel are racists, the evil consequences of left wing antisemitism would far outweigh any help it would give the oppressed Palestinians. But in fact it is hysterical and stupid to think that all Jews who support Israel are racists. Most of them have the haziest notion of the history of Jewish-Arab relations in Palestine. They do have an understandably vivid awareness that six million Jews were murdered in mid 20th century Europe. Naturally they are inclined to,believe its official spokesmen. Yet the recent outcry against the Begin government by millions of non-Israeli (Zionist) Jews and the vast demonstrations within Israel itself when the facts about Israel's treatment of Lebanon were made known, and it became impossible to shut out knowledge of Israeli complicity in the massacres, prove how far millions of Zionists are from being conscious racists. Most of them can be got to understand that the treatment of the Palestinian Arabs by the Palestinian Jews is a betrayal of the best traditions of the Jewish people. But idiotic attempts to treat them all as part of a "Zionist conspiracy" can only convince Jews that in parallel to what they see as the Arab threat to wipe out the Jews of Palestine, those in Britain who talk of justice for the Palestinian Arabs are a crowd of loony future pogromists. And that won't help the Palestinian Arabs either. The state of the left on this question is indicated by the fact that Ken Livingstone in the same issue of Newsline chattily adds his support to the idea that the Money Programme expose on the WRP was a Zionist plot. He hadn't then read the antisemitic editorial printed on the opposite page? What does he think of the editorial? Does he think we should just shrug and accept antisemitism as a feature of the far left? Perhaps what the Ayatollah Healy has discovered in his political dotage is not the "Protocols of the Elders of Zion" but the last will and testament of Joseph Stalin, who during his last years infected much of the Stalinist and quasi Stalinist left with his own ingrained antisemitism. At the time of his death in 1953 Stalin had set the stage for a purge trial of five "Jewish doctors" from the Kremlin's own hospital accused of plots, poisonings etc. It was to have been the signal for a final act in the vast anti-Jewish campaign, legitimised as "anti-Zionism" which had raged in most of Eastern Europe and the USSR since 1948 - which for example, was a prominent feature of purge trial like that of Rudolf Slansky in Czechoslovakia in 1952. The trial of the doctors would have been the signal for the mass deportation of the USSR's Jews - and possibly for their annihilation. Stalin's successors cancelled the trial, but antisemitism remains rampant in the Stalinist states. When the WRP (then SLL) went Maoist for a year back in 1967 Mr Banda, now the WRP General Secretary, wrote that they would "march" even under the portrait of Stalin. Once again he is "marching" under the portrait of Stalin. He won't write about it, but he is also uncomfortably close to marching under the portrait of Adolf Hitler".